What the hell is this......LL Bean Lohan? we wonder when Lohan will be rushed to the hospital again? we wonder what excuse she is going to give when she no-shows her next gig? we wonder if she ever had a diary that was stolen? we wonder if she will ever be a redhead again? we wonder if she is going to tattoo more stupid words on herself? And we wonder when the rest of the world will wake up and realize that she is a lot of hype, and very little talent? Is she staring in the Diane Keaton bio-pic or what? it was from a series of pictures for a magazine, she is imitating Diane Keaton in this pix, she also does Elizabeth Taylor, Liza Minnelli, and someone else i don't recall. she actually looks pretty good in all of them! Um... how old are you? 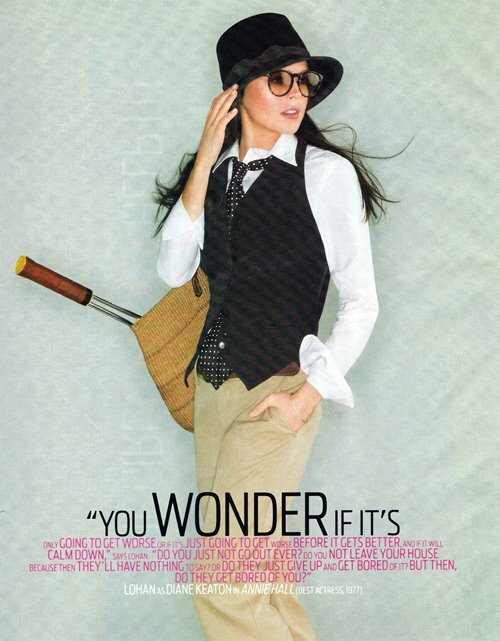 She's dressed as Diane Keaton in Annie Hall. Now, I may have been about 3 when that movie came out, but it is a classic and I get the visual reference. Oh, you did so good reading the caption off of the picture. Bravo anon. It is in Premiere Magazine. (the cover was on this blog with the caption about air brushing) She is "paying homage" to Diane Keaton, Liza Minnelli, and Elizabeth Taylor. A Socialite's Life has it on their blog.